TETER, LLP is honored to serve as architect and engineer for PG&E’s new Lemoore Service Center. 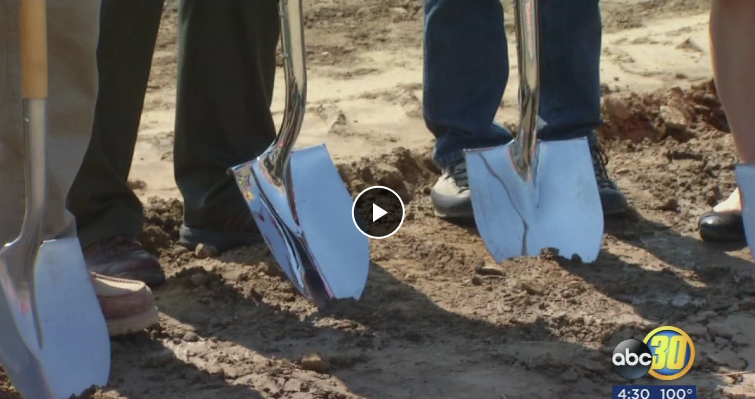 LEMOORE, Calif. (KFSN) — Hard hats and shovels turning dirt are sure signs of progress coming to the South Valley. The ceremonial groundbreaking for PG&E’s newest Service Center in Lemoore went off without a hitch. “It’ll be a modern facility– it’ll be more space for the workers in Lemoore than we had in our previous building, it’ll be an energy efficient building– just a lot of pluses for us and the community,” said Denny Boyles, PG&E. Sitting on almost 12 acres– the new location will feature building space, warehouse storage for materials, lots for service trucks, and electrical charging stations for employee and company trucks. “It’s a multimillion dollar project and there are going to be a lot of construction jobs created– hopefully local folks,” said Jack Richardson, Project Executive. Richardson, of Roebbelen Construction, said the site will accommodate crews that need to maneuver large pieces of equipment when servicing the area– especially during the busy storm season. A task that proves difficult at the current location on 19th. “There will be restoration crews, first responders, and other workers that will be sent here to work for customers,” said Boyles. The site will compliment service centers in Fresno and Dinuba to serve the South Valley– which they said is one of the largest service areas they have that continues to grow. “We know that Lemoore Naval Air Station is going to experience growth as they move a new fighter aircraft in. There’s a tremendous amount of demand for the agricultural side of this area,” said Boyles. The goal is to have the project complete by mid-2018, but Roebbelen hopes to have it done sooner.